Today, my exclusive interview with Pam Barnes (producer of Sale Of The Century, The X Factor, Australia’s Got Talent, The Singing Bee, to name a few) continues, as we discuss the revival of the evergreen game show that’s currently blitzing the ratings on Australian TV…. SH: Family Feud, the classic game show that keeps on keeping on. 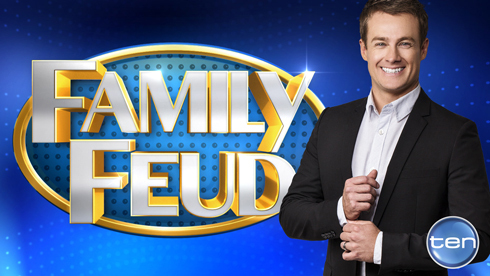 You’ve produced two versions of Family Feud on Australian TV; Bert’s Family Feud (from 2006 and 2007) and the current version on the Ten Network, hosted by Grant Denyer, which is very successful. What do you think it is that makes the show’s format so enduring? PB: I think its simplicity, and I think people have such fond memories of it. It has been around since the mid-70s and there has been a number of incarnations of it and each one has been successful. Each time it comes back, there’s a whole generation of people who used to love it and come home from school to watch it with mum, and all of that sort of thing. I think having it at 6 o’clock at night in 2014 is a really good idea. There is a lot of news that people don’t want their kids to be watching, so up against the news, it’s a good alternative. SH: It’s a true alternative. PB: That’s what we’re finding. We’re appealing to families who have young kids, a really young audience that we didn’t expect. I think that comes down to families not wanting to watch news in the traditional timeslot, plus these days there is a lot more news available at all times of the day. Whereas previously we would have to watch the 6 o’clock news to see what’s going on, now there is news all day, and there’s dedicated news channels, so people can be up with the news and still enjoy something completely different and family-friendly at 6 PM. Going back to the simplicity of the format, you can’t help but play along with it. They’re such simple questions, so the first thing that comes into your head, you say out loud; and then you yell at the television because you think the contestants are silly when they can’t think of the answers. PB: Or you compliment yourself – “I’ve got the top answer!” Sometimes it is the fourth, fifth and sixth responses that are the harder ones to get. The top one is quite easy because it is obvious but then some of the questions will take you in two directions as well. Like “name something you associate with a cottage”; the top answer was “cheese”. SH: That’s what popped into my head right there. PB: Whereas for most people it was “going down the garden path”, it was “cottage garden”, it was “flowers”, it was “plants”, “picket fence”. I actually like the questions that can take you two different ways. PB: You just need to have some grip on life. SH: Absolutely. What are the three most important things for someone to know if they want to be a contestant on Family Feud? PB: One is Personality. Bring your best ‘you’ on the day that you come to audition; be bright and enthusiastic. I think the ability to play the game is obviously a huge part of it. You may be a terrific family, but if you can’t play the game then you are not what we need. The other thing is being quick. And, sorry to be such a tease, that’s where we’ll leave it for now. Next week, as our discussion continues, Pam takes us through the audition process for Family Feud; the format of the audition, what’s asked of potential contestants, how the day plays out, and how the producers decide who’s in and who’s out. It’s as close as you can get to being in a Family Feud audition, without actually being in a Family Feud audition! So if you have even the slightest interest in becoming a contestant on Australian Family Feud, you simply can not afford to miss that! This entry was posted in 'Family Feud', Interviews, Updates by Stephen. Bookmark the permalink.